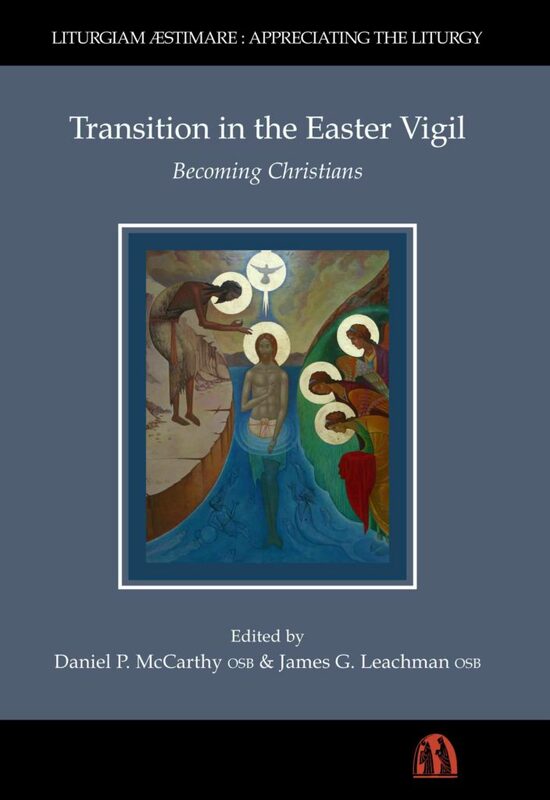 The book Transition in the Easter Vigil: Becoming Christians : Paschali in vigilia Christiani nominis fieri is the second in our series (Liturgiam Aestimare : Appreciating the Liturgy) editors: Daniel P. McCarthy – James G. Leachman, is now available through St Michaael’s Abbey Press, Farnborough, Hampshire. The context of the year. The Easter vigil is situated at the heart of the liturgical year and contains the rites of initiation for those who have been prepared by the prayers and rites of the OICA. The phrase hanc sacratissimam noctem, “this most holy night”, of the Easter vigil’s collect is closely connected with that of the Christmas vigil, thus emphasising the unity of the paschal mystery that begins at the Annunciation and concludes with Pentecost. The phrase gloria dominicae resurrectionis illustras, “you illumine [this most holy night] with the glory of the dominical resurrection”, in the collects of both Christmas eve and the Easter vigil also links the mystery of the resurrection with that of the incarnation and the illumination of the elect by the words gloria and illustras. Whereas baptism and confirmation are conferred only once, in the third part of the Easter vigil, the eucharist of the vigil’s fourth part is the repeatable sacrament of initiation, and this is celebrated anew each Sunday. Thus, in life and in worship God continually pours out life and love for the world, offering the divine self to us so that our fears of rejection be assuaged and we may respond, grow, change, and be converted, bathed, anointed and nourished to serve God’s world. For our study we selected twenty-eight of the Easter vigil’s orations, a term which includes both prayers, exhortations and an address, so that these may provide a more comprehensive understanding of the entire rite than is possible with a study dedicated to only one of the major prayers. Because of their brevity, each oration is more accessible and manageable than the longer euchology, and their detailed study provides a rich appreciation of the rite, of its deep structure and of its dynamic thrust. First in the orations we discern the self-revelation of God and the divine self-gift given first in the creation and especially in the Incarnation of the Word and the whole of Christ’s existence until his promised return. This continuous act of loving kindness elicits our response to that self-gift so that, receiving Christ, in the power of the Spirit we become Christian. Catechumens preparing for baptism and those renewing the promises of their baptism come to see themselves differently as they mature and the whole person is transformed on the personal, ecclesial and social levels and they become different, even to themselves. Such transformation is both axiological and an ongoing process. By axiological transformation we understand a change of state such as a coming to birth or becoming children of God. By the ongoing process of maturation we understand a life-long process of coming to be what one has received in baptism. We see ourselves going on being reborn as new.Second, the response of believers to God’s initiative enables their self-transcendence and self-gift in baptism and, with further stages of self-transcendence, their gradual maturation all through life in service of God and of others. The candidates and those already baptized receive illumination from the divine light – symbolized and mediated by the fire, the Easter candle, one’s own baptismal candle, the light of Easter day. They receive a new vesture and new identity in the community, symbolized by the stripping of the old self for baptism, the renunciation of the devil and the baptismal promises, the reception of the robe of glory in baptism, and of the baptismal garment. Thus they come to see themselves walking in newness of life. Such a new state of new personal identity enables self-reflection and thus, the development of an accurate self representation to oneself, to others in the assembly and to the world in which they live. Third, the full and conscious participation of each member of the assembly leads to the consequence of the whole assembly’s growth in self understanding. Thus there develops a process of ecclesial or community self-transcendence and growth, and with that, a new and accurate self-representation of the assembly to itself and to the world. This maturation of the assembly is not only respectful of each one’s new identity – yet in communion – but also is generative of new members and new life to the world. We see ourselves in the same tradition of liturgical research as Abbot Fernand Cabrol and the monks of St Michael’s Abbey, Farnborough who, at the beginning of the twentieth century, contributed so much to the development of the research dimension of the classical liturgical movement. We see ourselves too in continuity with Doms Leo Cunibert Mohlberg, Leo Eizenhöfer and Peter Siffrin, of the former Institutum Liturgicum (1950-1967), Sant’Anselmo, Rome, who prepared for the liturgical renewal, which would be mandated by the Second Vatican Council, through their corpus of critical editions of ancient liturgical documents published in the corpus Rerum Ecclesiasticarum Documenta (RED). Third, we see ourselves in continuity with the methodology developed and used at the Pontificium Institutum Sacrae Liturgiae, established by Pope Blessed John XXIII 15 June 1962. We want to develop our understanding of Christian maturation in the liturgy in further volumes in the series. We have set ourselves in future to name “in what Christian maturation in the liturgy consists” and “how the liturgy nurtures our Christian maturation”. These further studies will require an appreciation of our maturation in the course of a liturgy and over the course of a lifetime as well as the systemic understanding of the Christian assembly. Fr Dominic Carey CSSI is a founding member of the Comunidades Sacerdotales de San Juan, a Society of Apostolic Life in Ciudad del Este, Paraguay. He is Vice Moderator of the community. Having completed a doctorate in Sacred Liturgy at the Pontifical Liturgical Institute Sant’Anselmo in Rome in 2008, he is now Rector of St Joseph’s Seminary in Ciudad del Este and Episcopal Vicar for Seminary and Vocations as well as for Sacred Liturgy in the diocese. Fr Anscar Chupungco OSB is a monk of San Beda, Manilla in the Philippines. He studied liturgy at Sant’Anselmo where he later served as professor, Preside and Rector until 1997. He is the founder of the Paul VI Institute of Liturgy in Malaybalay, Bukidnon, the first dean of the San Beda Graduate School of Liturgy and retired as Rector of San Beda University, Manilla in 2007. Fr Alain Intimi is a priest of the diocese of Doumé Abong-Mbang in Cameroun, West Africa. He completed his Licence in Sacred Liturgy at the Pontifical Institute of Liturgy in 2008 and now works as professor of Sacred Liturgy and Formation in the major diocesan seminary of Notre Dame de l’Esperance in Bertoua. Fr James Leachman OSB is a monk of Ealing Abbey, London, tenured associate professor at the Pontifical Liturgical Institute, Rome and guest professor at the Katholieke Universiteit, Leuven, Belgium. He is assistant editor of Ecclesia Orans, co-founder of the project Appreciating the Liturgy. He is a founding member of the Institutum liturgicum. He has written articles on the liturgy of the Church of England in Ecclesia Orans, on the sources and theology of the RCIA in Studia Liturgica, and most recently in New Blackfriars in Sewanee Theological Review and in Questions liturgiques. Fr Daniel McCarthy OSB is a monk of St Benedict’s Abbey, Atchison, Kansas and guest professor of Liturgy at the Katholieke Universiteit, Leuven, Belgium. He completed a doctorate in Sacred Liturgy at the Pontifical Liturgical Institute in 2008. He is the author of five series of commentaries published in The Tablet from 2006 to the present, the first of which was published as Listen to the Word. He founded the Latin Summer School at Ealing Abbey, London in 2005 and is co-founder of the project Appreciating the Liturgy. He is a founding member of the Institutum liturgicum and has published in Ecclesia Orans and Questions liturgiques. Fr Patrick Regan OSB was abbot of St Joseph Abbey, Louisiana, for almost twenty years and served as President of the Swiss-American Congregation of Benedictines for twelve years. As a student he studied liturgy at the Institut Catholique, Paris. He teaches at Sant’Anselmo and has contributed many articles on the Liturgical year to Worship, Collegeville and book reviews to Ecclesia Orans, Rome. Fr Paul Turner is a priest of the diocese of Kansas City-St Joseph and pastor of St Munchin parish in Cameron, Missouri and of its nearby mission, St Aloysius in Maysville. He completed a Doctorate of Sacred Theology at the Ateneo of Sant’Anselmo, Rome in 1988. Author of several monographs and contributor to collected volumes on Liturgy, the most important and recent of which are Celebrating Initiation: A Guide For Priests, Let Us Pray: A Guide to the Rubrics of Sunday Mass and When Other Christians Become Catholic, he is a former President of the North American Academy of Liturgy and a team member for the North American Forum on the Catechumenate. He serves as a facilitator for the International Commission on English in the Liturgy. Fr. Manuel Eduardo Solórzano Zerpa OP is a priest brother of the Order of Preachers. He was superior of the community of Fray Bartolomé de las Casas in Caracas and assistant in the parish of Our Lady of Sorrows also in Caracas. From 2002 he was superior of the community of Our Lady of the Rosary and assistant in the parish of Our Lady of Ransom, Caracas. In 2007 he was sent to Rome to study Sacred Liturgy at the Pontifical Liturgical Institute, in the Athenaeum of Sant’Anselmo where he earned a Licence in Sacred Liturgy. Farnborough, Hampshire, England, GU14 7NQ. St. Benedict’s Abbey Development Office. The first review is online at the web-site here. It is written by Bosco Peters, an Anglican Priest and chaplain at Christ’s College, Canterbury, New Zealand. He runs a very active and ecumenical liturgy web-site. Pictures of the bass reliefs from the baptistery of Corpus Christi Parish, Lawrence, Kansas, were taken by Daniel McCarthy with permission of the pastor, Fr Michael “Mick” Mulvany. SABAK, J.G., The Theological Significance of “Keeping Vigil” in RomeFrom the Fourth to the Eighth Centuries, Submitted to the Faculty of the School of Theology and Religious Studies Of The Catholic University of America In Partial Fulfillment of the Requirements For the Degree Doctor of Philosophy, 2012 published online, accessed on 26 September 2018 from this link.